CASE is YOUR voice. Last week 78 CASE members from 25 states made visits to well over 100 different offices up on the Hill to advocate for Students! What an amazing couple of days we had and what an impact those visits will continue to have all year. On Wednesday morning the group gathered to share their stories and I wish you could have been there to feel the excitement and I know you won’t believe this but the encouragement this group exuded. It was an honor for the group to also have CEC Executive Director, Alex Graham participate and feel that excitement. His comments on the importance of the long term commitment as a resource to the gentlemen and ladies of congress was very reinforcing to the charges we received from our speakers on Sunday and Monday. CEC and CASE can help you be that long term resource. Start making your plans now to participate in the 13th annual CASE legislative leadership summit in 2015! 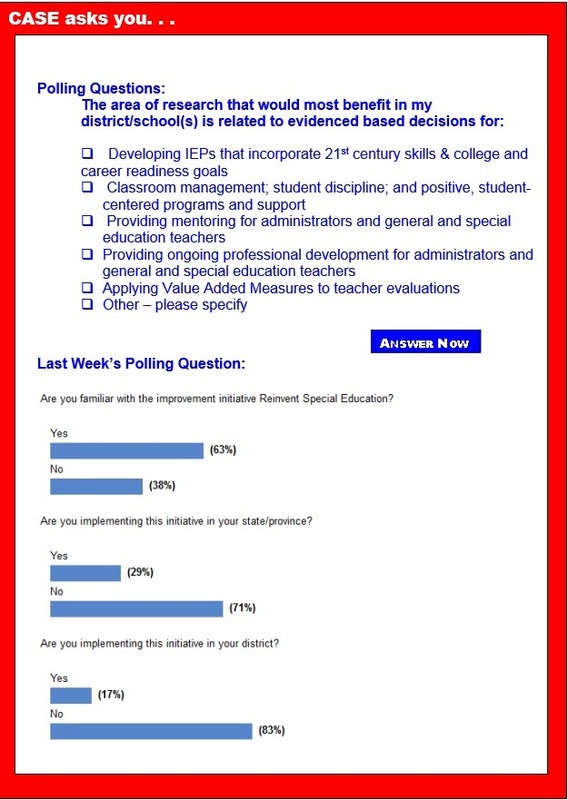 Thank You CEC for the Twitter feed on www.casecec.org! Have you checked it out? Go to the CASE website and see the TWEETS from the Summit. It was amazing to see all the great pictures of our members with their representatives and Senators. Our Wednesday discussion on Reinvent Special Education was a great beginning. Thank you to those of you who took the poll last week. We heard for 14 different states and 63 percent of you had some familiarity with the term "Reinvent Special Education," but only 29 percent indicated your state was working on this and only 17 percent saw any work on this at the district level. Our discussion on Wednesday morning asked the question as to what should be CASE involvement. If you have any thoughts on this topic or related ones, please post on our Facebook page, or contact our Policy Chair, Phyllis Wolfram (MO) or as always, me. Have you filled all your vacancies yet? If you haven't visited the CASE interactive job board at the CASE Career Center, now is a good time to do so! With its focus on special education administrators and professionals, the CASE Career Center offers members, and school districts, a highly targeted resource for online recruitment. Both members and non-members can use the CASE Career Center to reach qualified candidates. Employers can post jobs online, search for qualified candidates based on specific job criteria, and create an online resume agent to email qualified candidates daily. They also benefit from online reporting providing job activity statistics to track each job posting's return on investment. At LRP Publications’ renowned National Institute on Legal Issues of Educating Individuals with Disabilities®, April 26-29, 2015 in Denver, you’ll learn strategies to ensure that your special education programs comply with federal law and that students receive appropriate services. Register now to lock in at 2014’s rate! Senators to advance international disability treaty; Your advocacy needed! Here's how to advocate for individuals with disabilities across the world in only 2 minutes: On Tuesday, the Senate Foreign Relations Committee will consider whether to advance the United Nations Convention for the Rights of Persons with Disabilities, an international treaty that protects the human rights of individuals with disabilities. Opponents continue to use inaccurate scare tactics to diminish support in the Senate. Join CEC in correcting the record — email your Senators today! The CRPD can only be voted on by the full Senate if it passes the Foreign Relations Committee — urge your Senators to support the treaty. Senator Harkin, D-Iowa, a longtime disability advocate, is leading a renewed advocacy effort to ratify the United Nations Convention on the Rights of Persons with Disabilities, an international treaty that is the vital framework to protect the human rights of persons with disabilities across the world. As President Obama readies to sign the Workforce Innovation & Opportunity Act into law, following overwhelming, bi-partisan approval last week from the U.S. House of Representatives and U.S. Senate in June, here are 4 key provisions that impact individuals with disabilities. The White House has been without a liaison to the disability community since Claudia Gordon left the position in April, after less than a year on the job. But recently, Taryn Mackenzie Williams assumed the role of advisor within the White House's Office of Public Engagement, providing a bridge between the disability community and president. For far too long, we as a nation have set unnecessarily low education expectations for students with special needs, limiting their choices and opportunities for success. But thanks to a new U.S. Department of Education directive, things are changing for the better. The department is shifting to a new approach for the nation's 6.5 million children and youth with special needs by focusing on student outcomes instead of simply on how well states comply with procedural requirements. There are three distinct types of attention-deficit/hyperactivity disorder that match up with children's personalities, some researchers suggest. What's more, looking at these ADHD types is better than the current diagnostic methods in predicting which children will go on to develop further mental-health problems, the researchers said in the new study. The finding of these three types is preliminary, and won't be used in diagnosis anytime soon, but it shows that it's possible to classify mental-health disorders in a manner that's based more on biology than symptoms, which may help researchers better understand the underlying cause of these conditions, the researchers said. What a difference a year makes. The Christie administration this week introduced new code for special-education services that skipped over most of the hot-button topics on how to serve students with disabilities. The new administrative code submitted to the State Board of Education contained changes that were mostly technical in nature, officials said. Where are the nation's 'most productive' school districts? Is your school district spending its likely tight budget on the right things? New reports suggest many aren't. Three reports by the Center for American Progress, a progressive think tank, examine whether districts are properly targeting their budgets to areas that will most effectively address academic success for students. The reports are a follow-up to a similar assessment the group completed in 2011. A new state law aims to help Illinois students with dyslexia. The law entitles dyslexic students to special education services. It also creates a reading instruction advisory group that will train educators on how to identify and teach students with dyslexia. Gov. Pat Quinn signed the measure. The law is effective immediately. The move to local control under the state's new funding and accountability system has given school districts much leeway in adopting the Common Core State Standards, the challenging math and English language arts standards that California and 41 other states and Washington, D.C., have adopted. And that flexibility, concludes a new report by researchers from Stanford University's Graduate School of Education, has the potential to create disparities in implementation the state should reduce. In the roiling national debate about the best ways to improve public education, one aspect gets scant attention: the relationship between the tax dollars school systems spend and academic results. In a report, the left-leaning Center for American Progress looks at how much "bang for the buck" taxpayers are getting from public schools. Ulrich Boser, who wrote the report, analyzed budgets of 7,000 school districts across about 40 states — which enroll about about 80 percent of U.S. public school students — and found some surprising results. A study observing the genetic basis of cognitive traits, led by scientists from the University of Oxford and King's College London, finds that about 50 percent of genes that have an influence on a child's reading ability, also have an effect on their mathematics aptitude. Complex cognitive traits such as reading and mathematics are highly heritable and are shown to be associated with quality of life including wealth and life expectancy. That said, there is little understanding of the genetic architecture of cognitive abilities, genetic components and the correlation between them. Parenting a child with ADHD can present various challenges because of the disorder's symptoms, such as hyperactivity, impulsivity and inattention. Kids with ADHD may have every intention of respecting a rule, said Elaine Taylor-Klaus, CPCC, ACC, an educator and parenting coach. But they may break it — often "by accident than on purpose." What is "storytelling"? Telling stories, of course! In 2014, there are so many diverse, wonderful, and sometimes overwhelming ways to do this. What I want to explore is traditional, oral storytelling, which has been a part of human life since we first left Africa 200,000 or more years ago. Perhaps storytelling was the reason language developed in the first place, as our minds began to inquire, wonder, think. When Mollie Cueva-Dabkoski was dissecting a sheep's heart during an eighth-grade science class, she had an epiphany that changed her life. "That heart told the story of anatomy and physiology!" she said. Realizing that science is best communicated through stories, Cueva-Dabkoski, now just 19 years old, went on to explore beetles in China. She's now at Johns Hopkins University, and continues to do research during breaks. For far too long, we as a nation have set unnecessarily low education expectations for students with special needs, limiting their choices and opportunities for success. This is a request for comments on what we think the Dept should do to (1) address disproportionality on the basis of race and ethnicity in the "identification, placement, and discipline" of students with disabilities, placement in particular settings, and the "incidence, duration, and type" of disciplinary actions; and (2) to ensure that "early intervening" funds are used "to effectively address disproportionality."